THE AUSER TIMES: Ukrainian people should acknowledge fact on how there is nothing to be proud about when it comes to so called "white nationalism"(white is broad term used when nazis need broad support from otherwise have considered even as material fit for extermination - this is what we Slavs were listed for time and again) and embrace prosperous Western type of democracy along with Poland. The two primitive criminals(both jailed for stealing taxes from American taxpayers, stealing money from their supporters, terrorism, and public incitement in all sorts of hate crimes) blamed(labeled - marked) every individual who would even approach to Ukraine and offer assistance as a evil Jew and have connected Jews with all evil imaginable on this planet. We could say that so called white nationalism(just a weakness which Russians have managed to effectively hide from world thanks to media) which brought to Ukraine nothing more than death and destruction was/is nothing but death for beautiful ethnic Ukrainian people. With Ukraine under disguise of so called white nationalism, we all loose...and its why I will continue to insist on real values for Ukrainian people and world which will also change course of events in Russia(collapse of Kremlin thugs). I imagine Eastern part of Europe as an mixture of independent Slavic states which will rather cooperate with one another and celebrate existence via prosperity(not hostility as the case is) with one another. It would be nice to go to Ukraine(or Poland) and from Ukraine to Russia(and opposite) without fear to be murdered along the road. It would be great if Russian people could go out on streets and freely express their opinion/views on situation...it would be great if we could celebrate all this with other people whose civilization reached top scientific accomplishments and are more than willing to share them with us(state of Israel as an very very good example)...it would be great if so called gypsies(Roma people who arrived here from India and have had great difficulty to integrate in society die their customs and physical looks) could get decent housing and jobs(we could arrange for them state programs along with India which would be beneficial for all of us - they understand, but can act alone with great difficulty due to prejudice and all sorts of obstacles which they are facing in our societies). Well, for that matter you the people of Ukraine will have to take step forward to demonstrate to the world self initiative on how you are more than just Russian proxy(its how I see Ukrainian parliament and Poroshenko as) state(operated from Kiev nation)...so do the unthinkable for Kremlin's nazis...take initiative to the streets and demonstrate real Ukraine and willingness to deal with hatred issues in same was as they deal with one in....well...in...in where...Poland !!???? I would love to repeat work Poland, but how...when !!???? This hateful garbage managed to exterminate "only" 12 million Poles and Ukrainians beside burning both countries to the ground...why would it be any different this time !!???? Are we going to finally create law which will strictly condemn nazi(incl. 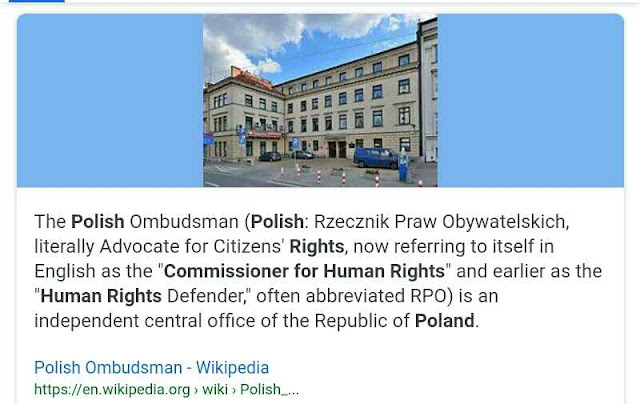 red coated gestapo) related issues and demonstrate world on how there is no place for one in Poland(many other European states will gladly follow such example incl. Ukraine in case you too decide to take step in that direction - I feel not enough is being done in this aspect). And who else in this world will do it if not you who were both victims of Stalinism(red coated fascism) and German neonazism !!???? Roma people if given equal opportunity would agree and comply with social quotas...quality of life is their best interest as well...but like this, they have almost nothing other than agony to live for. Lets see what will happen...Poland and Germany are three times as big as Germany is and on most important location in Europe(and that means world)...will two manage to create own unique national identity of which their survival and survival of the Europe/world depends on along with other Eastern European states or will they play Berlin/Moscow game...time will show. NATIONALISM YESS, AND SO CALLED WHITE NATIONALISM(CODE WORD FOR "NAZISM" INVENTED BY NAZIS TO DESTROY NATIONAL PRIDE OF SLAVIC LANDS AND REMOVE BORDERS BETWEEN US SLAVS AND THOSE WHO WANTED AND WANT TO EXTERMINATE US) IS AN A NO NO !!! KIEV, Ukraine — The Roma who live in tarpaulin camps and abandoned buildings in and around Kiev, the Ukrainian capital, say they make their money harmlessly by picking wildflowers and selling the bouquets to lovers on the city’s streets. But members of Ukrainian nationalist groups say that, instead, the Roma pick pockets, steal scrap metal and foul the city with their presence, often dressed in rags or hand-me-downs while begging. Tensions over the Roma are as old as Ukraine, and run as deep here as anywhere in Eastern Europe, but the ancient enmity has taken a twist recently. 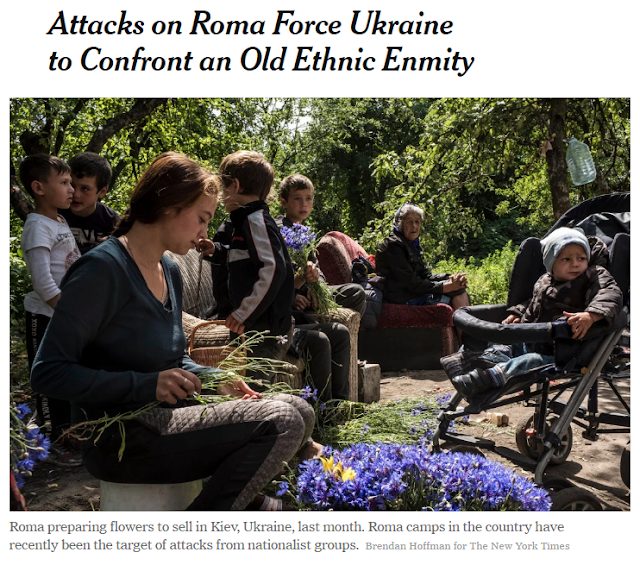 Beginning in April, Ukrainian nationalist groups that were given free rein four years ago to fight the Russian military incursion have taken instead to attacking the softer targets of Roma camps, saying they are “cleaning” Ukraine’s cities. After an attack in April on a camp in Lysa Hora park outside Kiev, when a nationalist group threw rocks, squirted pepper spray and burned down tents, it seemed like an outbreak of the old ethnic scourge, and the episode drew criticism from Western governments and rights groups. The Ukrainian government seemed to see the assault differently, at least at first. Far from prosecuting the nationalist group, known as C14, which filmed the attack and posted photographs on the internet, the government gave it a state grant in the form of free rent for auditoriums to support “patriotic education.” and so on and so forth...it hurts me to write about stuff like this when it comes to Ukraine which suffered so much, so please do something about it.